In an Elent CVT, the AC mains powers the input winding which is widely separated physically from the isolated output winding. The input winding normally runs at very moderate Flux linkage levels. The output winding exhibits an intrinsic energy characteristic and this energy storage operates in conjunction with mains capacitor to produce self-generated AC flux field which is indirectly excited from the input winding. The result is instantaneous voltage regulation. No transient and spikes. Sinewave output. A perfect answer and remedy for every electronic equipment. Elent CVT is available in a wide range.. from 50 VA to 10,000 VA with load test conducted at unity power factor for all ratings. For configurations other than those mentioned above, please contact our office. 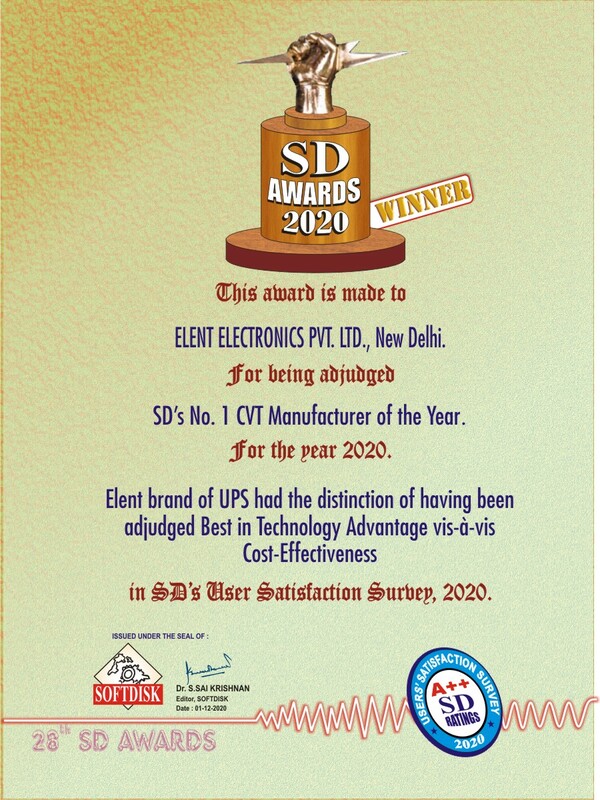 Computers, Data Processing equipment, Colour Photography Labs., Bio-medical equipment, PA equipment, Telecommunication, TV, VCD/DVD recorders & players, Teleprinters, Fax machines and all other sensitive electronic devices. Avoid using the CVT for high inductive loads. Switch OFF the CVT when not in use.